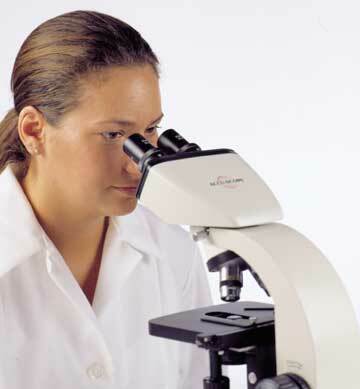 ACCU-SCOPE® Microscopes have been engineered in America to the highest quality standards for more than 50 years. As a distributor of these well respected, dependable instruments, we offer a full line of microscopes, from simple microscopes for hobbyists to research-level microscopes for laboratories. These sturdy, long-lasting microscopes are designed to meet the requirements of routine science, clinical, biological, and high-tech industries at an economical cost. ACCU-SCOPE microscopes are available in a number of different models, including monocular, binocular, stereo, and inverted microscopes. ACCU-SCOPE has a complete selection of modular, interchangeable components, eyepieces with pointers and reticules, and objectives that enable you to easily configure the microscopes to your exact requirements and ensure you maximum ease in use. Accessories are available for Brightfield, Darkfield, Phase Contrast, Polarization, and Photomicrography. ACCU-SCOPE microscopes are unequaled for research, educational sciences, hospitals, clinical laboratories and industry. We have access to a wide range of microscopes and related products! Please call our experts for advice or to help you make the right choice.